Hats off to all you SF bikey parents. We salute you. When the borrowed child is attached to your bike via a borrowed tag-along, you know where they are. I assume that kids who’ve grown up in the City, have been a passenger on your bike, have been a tag-along kid, and then get their own bike have a sense of the streets and you feel more comfortable. Riding behind Rich and Jenny on Fell Street on the way to the park I admit I was a bit worried. All was fine, but I do wish our streets were more friendly to all cyclists. Soon to pedal off on her own. 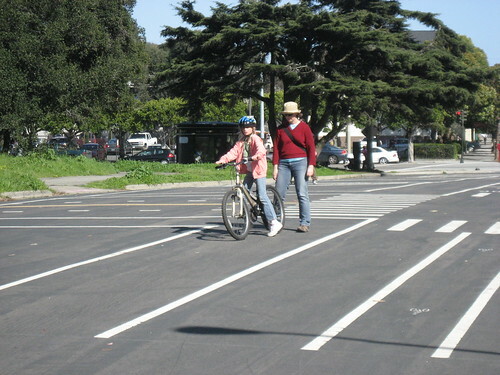 The bike learning area on Waller at Stanyan is a great place to practice starts and stops and turning. I know why parents cycle with their kids – it’s fun and a great way to get around. And watching a child start to pedal on their own is an amazing feeling. The next generation of happy cyclists is here. Hey, I’m looking for the post that goes on the back rack for the tag-along bike like in this picture. Can you let me know where you go that one?